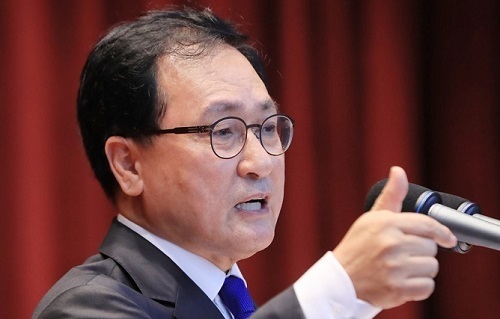 South Korea's new chief ICT policymaker said Tuesday that he will push forward tough reforms as the country must deal with various challenges under the fourth industrial revolution. "The Ministry of Science, ICT, and Future Planning should be reborn so that the ministry that can prepare for the future amid the changes," You Young-min said during his inauguration ceremony. The government has been engaged in various projects to cope with the latest revolution that is characterized by a fusion of cutting-edge technologies, such as big data and the Internet of Things. "In order to make good use of the fourth industrial revolution, the ministry needs patience and devotion from its members," the 66-year-old You said. Earlier, the State Affairs Planning Advisory Committee announced that the Ministry of Science, ICT and Future Planning will be the main government body to coordinate plans for the next five years. The new minister said he will work with other related agencies while operating the budget for research and development in the science and technology field. The ministry earlier announced that it will spend 1.52 trillion won ($1.3 billion) in 2018 on various science and technology R&D projects, subject to parliamentary endorsement later this year, up from 1.26 trillion won allocated for this year. You, with nearly 30 years of experience in the software sector, said he plans to transform the country so it will become a leader in this critical field. Born in the southern port city of Busan, he started his career at major tech firm LG Electronics Inc. in 1979. He is one of the first to be tapped as a chief information officer at a local tech firm, when the title was new to the business community as a whole.